Cruises are becoming increasingly popular as more and more travelers consider the benefits offered by this form of vacation. A cruise allows you to simply sit back and relax, letting the crew and staff members do all the hard work for you. You don’t need to worry about food preparation, accommodation, travel, or anything else; all services and amenities are provided on board, with good quality food served up round-the-clock and lots of additional facilities and luxuries provided on many of the best cruise liners like cinemas, spas, swimming pools, and more. Not only that, but cruises also allow you to visit multiple destinations all in one trip, making the most of every single day without any time wasted. There are many popular cruise destinations all around the world, including the Caribbean Islands, the islands of the South Pacific, South America, Mexico, Europe, and more, with a cruise to suit every kind of travel. However, when booking a cruise, it’s important to find the right price and the right option for you. That’s where Priceline comes in. Priceline is a travel price comparison site offering some of the best cruise deals and biggest cruise discounts you could ever hope to find. Priceline is in close contact with various cruise operators in order to find and fill empty cabins and suites at lower-than-normal costs, passing the savings on to the travelers. This means that booking a cruise with Priceline is a good way to get a great deal. Booking a cruise with Priceline is simple. The site is nicely laid-out, allowing prospective passengers to search between different cruise lines, lengths, destinations, and more. It's very easy to find the cruise of your dreams with Priceline and bookings can be easily made online or over the phone. Priceline also offers a lowest price guarantee if you can find the same cruise elsewhere for a cheaper price. In fact, the company runs a '110% Best Price Guarantee', meaning that if you book a Priceline cruise and find it cheaper elsewhere, Priceline will refund 110% of the difference. Cruise prices with Priceline tend to be very attractive in general and Priceline will run sales and discounts at various times throughout the year, including on special occasions like Black Friday, in order to help travelers save more cash and enjoy high quality cruises for less. There are many additional ways to save money on cruises with Priceline including special rates for people aged 55 and older, super low costs on repositioning cruises, and lots of money-saving opportunities for single occupancy cruises. 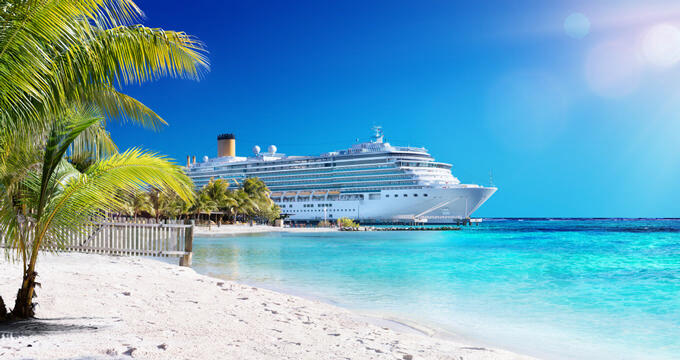 One of the best things about booking a cruise with Priceline is the huge variety offered by this company in terms of destinations, departure ports, and cruise themes. With such a lot of variety to find, you won't need to look on any other site to book the best cruise for you. All kinds of cruises, from 1-2 night trips to journeys of multiple weeks, can be found on Priceline. A long list of cruise lines are featured on the site too including all the big names like Norwegian, Carnival, Royal Caribbean, Costa, Princess, Ponant, SeaDream, Oceania, and more. In terms of departure ports, Priceline features over 20 different departure locations in the United States, as well as ports all around South America, Australia, Europe, and beyond. The majority of Priceline cruises will tend to leave from locations like Miami, Los Angeles, New York City, and Vancouver, but there are a lot of options here so if you're looking for something a little different, you should be able to find it. Som of the most popular cruise destinations with Priceline include the Bahamas, Bermuda, Cuba, Mexico, Hawaii, many different Caribbean islands, and a lot of major ports around Europe too. Another fun thing about using Priceline to book your next cruise is that the site allows you to search by theme. For example, if you're looking for a family cruise, a range of options will be proposed to you that offer good value and lots of options for families. Other themes include summer cruises, luxury cruises, last-minute cruises, and cheap cruises, so there's something for everyone.